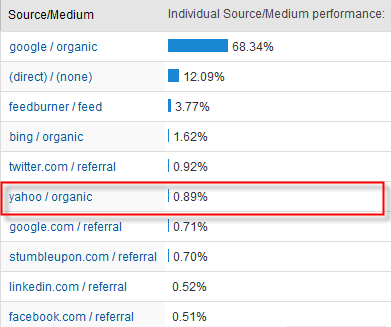 Drilling deeper reveals that our Yahoo referrals are drastically lower than both Google and Bing, furthermore Yahoo referrals are lower than both Feedburner and Twitter. Are you listed in the Yahoo directory? Seems to have a large influence on Yahoo rankings. On my established sites Yahoo accounts for a little under 10% of the search engine traffic but it's usually somewhat erratic and I have never tried to optimize for Yahoo I only optimize for Google and let the others join if they want. Same results here on many different sites, blogs, regular sites, one page wonders. Doesn't seem to matter what niche or what style or whether it's in the Yahoo directory or not. 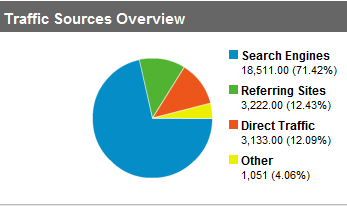 Yahoo search traffic to any site I've done for myself or my clients is negligible. I don't waste any time at all on Yahoo there is no return in doing so. Try a wordpress blog that is the future it is SEO friendly and the search engines have no issues caching and ranking these pages. I agree with Karen...whats the fuss on using Yahoo if there is no return on your effort optimizing the site..cheers. I see the same thing happening in Bing as well.